Blue Chip Butterfly Bush - Non-Invasive Buddleia? Broadleaf, deciduous flowering shrubs. However, in Northern climes, they act as if they were herbaceous perennials. Blue Chip butterfly bush reaches a height of 24 - 36 inches, with a similar width. The shrub displays a compact, mounded habit, being categorized as a miniature Buddleia. Its numerous, small flowers form in showy spikes. Dubbed a bluish-purple, the flower really contains only a hint of bluish color. Flowering time is listed as being from mid-summer to into October. My own receive more shade than they should, which delays bloom time: Mine begin blooming in August. Grow Lo & Behold in planting zones 5-9. Plant Lo & Behold in full sun and in well-drained soil. The plant is considered to be a drought-tolerant shrub. No deadheading required! The fact that these shrubs are deer-resistant will also please those seeking low-care plants. Mulch Buddleia in the fall for winter protection in cold climates. When to prune Buddleia is a common gardening question. Although there isn't one agreed-upon time for pruning Buddleia, I leave the brown branches in place during most of the winter (in hopes that they will provide a bit of protection from the cold) and prune my plants back to the ground in late winter. Buddleia re-emerges from its root system in spring. Pruning is actually optional (especially on the compact Blue Chip butterfly bush) but does seem to promote better flowering. This shrub will be employed in the landscape in many ways; for example, in cottage gardens. Larger types of Buddleia are typically grown in the back row of layered plantings, but this more compact version is well suited to placement in the middle row of a flower bed. 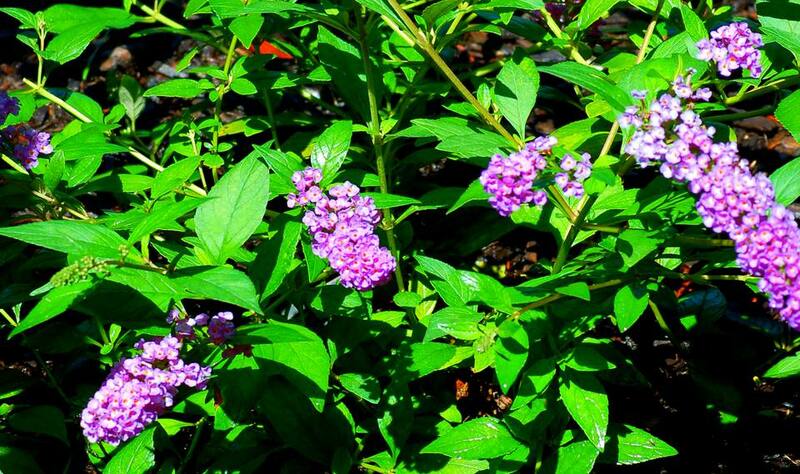 Some will want to mass Blue Chip butterfly bushes together along a property line to form a border, while others may install them in foundation beds. Besides the obvious, the shrub attracts hummingbirds and so is useful in hummingbird gardens. Aesthetically speaking, the fact that Lo & Behold blossoms so late into the year means that it will display fall flowers at a time when few other shrubs are flowering. Its miniature stature is also a major selling point. But aesthetics aside, many growers may end up valuing Blue Chip butterfly bush most for what it is not, and what it is not (allegedly) is an invasive plant. You see, Buddleia is indigenous to the Far East. Like many plants from China and other faraway lands, the typical Buddleia grown in certain parts of North America has acted in an invasive manner. It's not invasive everywhere, but it's invasive in many areas, such as the Pacific Northwest; ask your local Cooperative Extension if in doubt. But with this cultivar, developers may have succeeded in producing a non-invasive shrub. Horticulturist, Tim Woods says, "University studies have shown that Lo & Behold 'Blue Chip' is non-invasive," pointing out that 'Blue Chip' is not Buddleia davidii but rather a complex "hybrid that contains three species." Woods notes that this cultivar is "male sterile" (doesn't produce pollen) and "produces just trace amounts of seed (even when grown in close proximity to other cultivars) compared to millions of seed on a typical Buddleia davidii." A non-invasive Buddleia would have lots of gardeners running around shouting, "Lo & Behold!" Interested in a Blue Rose of Sharon?